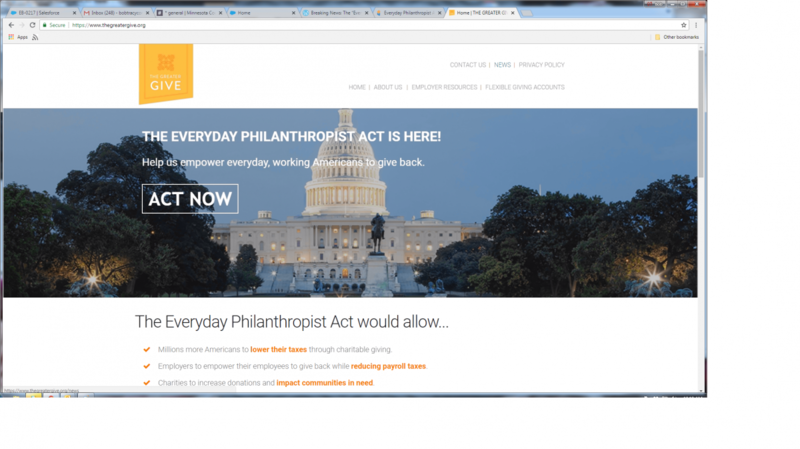 What can you tell us about the proposed Everyday Philanthropist Act? A bill was introduced in Congress earlier this month to allow employers to set up "Flexible Giving Accounts" (similar to flex funds for health or child care expenses) that would allow employees to make charitable gifts from pre-tax dollars. The lead author for this bill is MN Rep. Erik Paulsen (R-3rd District). Here's a statement by TASC (Total Administrative Services Corporation) CEO, Daniel Rashke describing his leadership in this effort. TASC, a major employee benefits services provider, has set up a lobbying group called "The Greater Give" to promote the bill. We understand from Rep. Paulsen's office that he was encouraged by former Rep. Scott Klug (R-WI) to introduce this bill. Klug is the director of public affairs for Foley and Lardner, LLP, the registered lobbyist for TASC. We also know the proposal is getting some very serious vetting by House Ways & Means Committee leadership and staff with an eye toward including it in a "Tax Reform 2.0" bill or similar legislative vehicle, yet this year. We are looking at this at MCF. Our public policy committee's tax policy subcommittee is talking about it. We have connected with our national advocacy partners. And, as I noted, we have been in touch with Rep. Paulsen's office. We appreciate this idea as a recognition that the 2017 tax bill is likely to have a disruptive impact on annual giving. However, we have questions. Is this a better alternative to a Universal Charitable Deduction? Do employers and employees want this? At the moment, we are interested in what you think. Send us an email or give us a call. at 612.335.3558.